I first cut the backpack in half leaving the straps intact, I then cut 2 peices of PVC pipe and inserted them into the foam from the bottom leaving enough length of PVC sticking out of the body, I then inserted the poles into 2 slits that I cut into the top of the backpack. I got my hiking backpack frame, inserted the top of that into the cut 1/2 of back pack then duct taped the PVC poles to the frame. This can be made using a rolling backpack aswell, but I opted out of the after noticing how unsturdy it was and leaned around too much. The hiking frame was perfect for me, because it really helped support the basket, and repositioned the weight and it had a cushioned heavy duty waist strap which really kept the costume in place, it also took off a lot of weight and pressure from her upper back and shoulders. I wanted something sturdy and comfortable. I made the mask with glowing eyes by using a regular mask, a styrofoam head (for wigs) Fake acrylic eyes, and an LED light kit. I then made the arms and legs out of stuffing, and nylons. I stuffed the arms then attatched them to my upper body, got the nightgown, cut a hole in the middle for my daughters upper body to fit through. I got an old pirates dress, cut off the skirt, left the shirt intact, I then sewed a red skirt, a ruffled petticoat to the the front of the shirt so it hung like an apron and would cover the fake legs without showing a seperation from my daughter body. I got an long old red cape, started in the middle at the seam then cut up to the hood. I did this so as to not have the cape bunched up on the straps of the backpack. This way, she put on the cape and we pulled the backpack straps through the slit and it allowed the cape to fall into place perfectly. I then got a large wicker basket, cut out a square from the back and bottom large enough for her waist to fit comfortably, got a long velcro strap and looped it through the basket to hold it into place while pulling the strap over her head with her arms fully through and allowing the strap to rest on the backpack straps, and not cause stress on her neck. I then cut the nylons in 1/2 to seperate the stuft legs, I pushed the nylon material through the wicker slats, and tied a knot at the ends so they wouldn't slip out. I made her wolfs legs that she wore using grey furry knee length boot covers, a pair of furry slippers that I spray painted grey. This costume was a big hit. 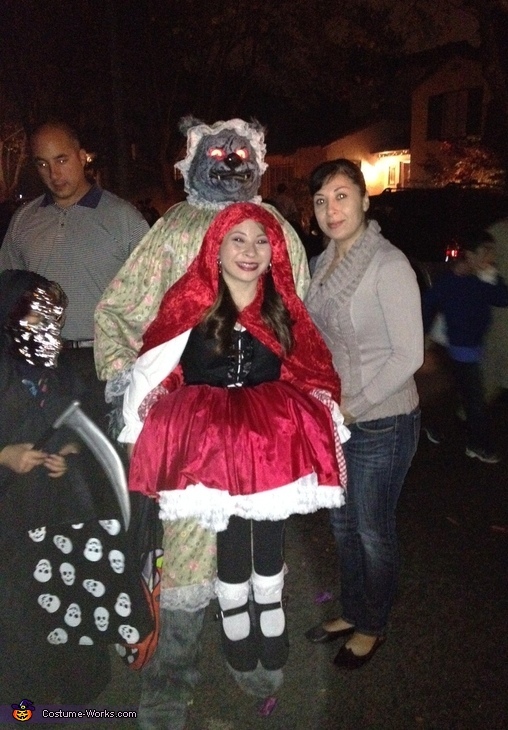 A lot of pictures of her and with her from people who were so impressed with the costume. Oh the bonus was extra candy. She felt like the center of attention all night long. She said now she knows how a celebrity feels like. Ha Ha..cute. Wow! This is so cool! Illusion costumes are my favorite!